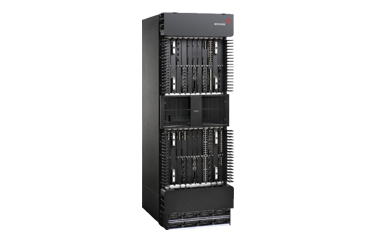 The Brocade NetIron XMR Series of Internet backbone routers provides unparalleled performance (up to 2 billion PPS) in a multi-terabit architecture. These routers offer highly scalable IPv4/IPv6 routing, fast BGP convergence, and advanced MPLS capabilities such as MPLS VPNs. They provide industry-leading wire-speed 10 GbE and POS port density, and are ideal for Internet backbones and service provider cores. The Brocade NetIron CER 2000 Series is a family of compact 1U routers that are purpose-built for high-performance Ethernet edge routing and MPLS applications. These fixed-form routers can store a complete Internet table and support advanced MPLS features such as Traffic Engineering and VPLS. They are ideal for supporting a wide range of applications in Metro Ethernet, data center and campus networks.